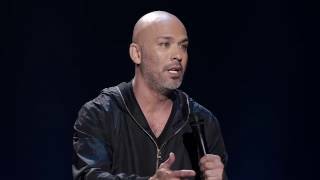 From filling clubs across the nation to being seen weekly as a regular guest on Chelsea Lately, Jo Koy has come a long way from his modest start performing at a Las Vegas coffee house. His infectiously explosive energy on stage, insightful jokes and family inspired humor cross all boundaries and led Daily Variety to name him one of the “10 Comics to Watch”. Born in Tacoma, Washington, Jo credits his mother for his comedic and acting talents. Growing up, his mother constantly encouraged him to take part in school talent shows or present impromptu performances for his family and friends. This encouragement led to the Las Vegas coffee house, then a move to Los Angeles, and finally a performance on The Tonight Show with Jay Leno in 2005. He became one of a select few to ever receive a standing ovation on the show. Since his Tonight Show performance, Jo was part of Carlos Mencia’s “Punisher Tour” in 2006. He has appeared on Jimmy Kimmel Live, Last Call with Carson Daly, BET’s Comic View, Jamie Foxx Presents: Laffapalooza, and appeared in various VH1 I Love the 70?s, 80?s and 90?s episodes. His Comedy Central special “Don’t Make Him Angry” aired in January, 2009 and is now available on DVD. He is a regular featured comedian at the world famous Improv, tours the college circuit nationwide and performs in comedy clubs both in the US and internationally. Jo lives in Los Angeles.